UPDATE: Tim has kindly documented more pages from the manual, and posted them to his Flickr. 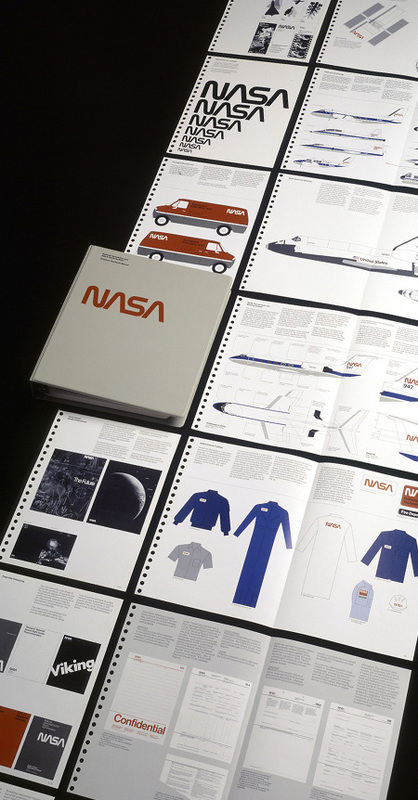 12 Comments on "NASA Graphic Standards Manual – 1976"
Shame on the USGov. for going back to the orig. design. I miss the old NASA font/logo. I think it still holds up in a “that’s what I expect a NASA logo to look like” kind of way. Not sure why they ever changed the branded. It’s timeless. NASA changed the branding because the branding reflected an attitude and organizational culture that very publicly killed 7 people in 1986. Also the meatball makes a better looking patch. When NASA chose to abandon this brilliant and futuristic design and go back to the retro logo, it was like Apple abandoning the white apple symbol and going back to the overly complex wood carving illustration of the apple tree (its first logo). The real reason why NASA went back is because a bean counter was put in charge of the agency and he had to piss his mark (no pun intended) to prove he was all about “change”. Sadly, this is why many great brands are put to death illogically. People who know nothing about design or branding think they do (or don’t give a crap) and give up something good they did not know they had in hand! The NASA identity is not for NASA employees, it is for selling the product the agency produces. The old emblem should have been kept as some sort of special insignia – like the emblem for the agency astronauts only. Worn on suits and uniforms, painted on trucks and equipment for manned space flight. 3) a university seal (most often used by the president only and on diplomas but sometimes, it is also part of the identity). NASA should have the Danne & Blackburn system for all official stuff going out to the public. The older “seal” could be reserved for special mostly in house uses making it special to NASA historically. Nice find. I’d love to see the whole manual. As a child of the early 70s, the NASA worm logo has a special place in my heart, and it’s fascinating to see how the implementation of the design was so well thought out across multiple platforms. That being said, I question the 1976 date attributed to this particular manual (the AIGA site it links to states it was printed in 1975). My guess is that the featured sample is an updated reprint of the original graphic standards. I only say this because there are diagrams of the Shuttle, Shuttle Training Aircraft (STA), and Hubble Space Telescope which do not correlate to their appearance (or existence) at such an early date. The Enterprise test bed was the first shuttle vehicle rolled out, at the end of 1976, and indeed it carried the NASA worm logo, but the final pattern of the shuttle’s black thermal protection tiles (esp. around the nose and cockpit of the craft) had not yet been developed. The tiles as shown on this graphic manual’s diagram are in their final tile arrangement (which was a result of engineering necessities discovered through testing). Enterprise featured a more elegant, curved separation of black and white thermal surfaces at the nose of the craft. The choice of the Gulfstream II for the STA was not decided upon until 1977 (the A-6 Intruder was also being considered prior to that date). Also, NASA did not begin the design and construction of Hubble until its budget approval in 1978, so the position of the worm logo on the telescope, much less the final design of the satellite itself, would probably not have been a consideration for graphic implications as early as 1976. I have a manual from 1976 in mint condition. I would buy a copy of this book. Anyone has a copy for sale? Would love to buy too. how about providing us with a high-res scan/ pdf ? I would be mainly interested in that pdf, but if necessary would even buy/ borrow the manual to provide a scan for everybody (if legally possible, copyright is so difficult these days). Just write me if you still read these comments.